Be the first to know! 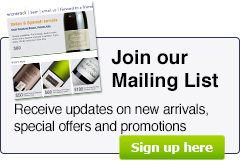 Sign-up to receive information on the latest offers, wine tastings and events, delivered direct to your inbox. Privacy: We will not pass your details to any third party, will ONLY use the address for the purpose above, and you can unsubscribe at any time.